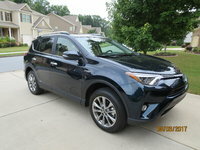 CarGurus has 3,052 nationwide RX Hybrid listings starting at $9,995. The Lexus RX was all-new for 2016 with a complete redesign, so 2017 sees a continuation of that model. 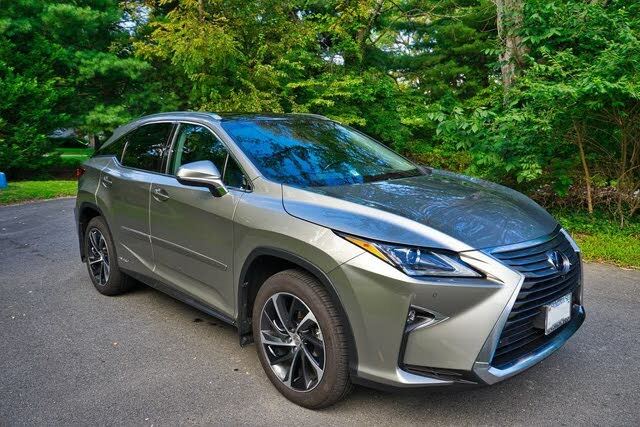 The RX 450h is the hybrid version of the RX crossover, with a 3.5-liter direct-injected V6 gasoline engine combined with the Lexus Hybrid Drive system for a total output of 308 hp. That hybrid system was also redesigned last year, for better efficiency and improved responsiveness, and is paired to a continuously variable transmission. The RX features an adaptive variable suspension with a dial that adjusts the electronically controlled shock absorbers connected to each wheel. You can tailor your drive to match road surface, vehicle speed, or simply your personal driving preferences. There’s also Drive Mode Select, with several modes from which to choose: Sport S mode offers stronger throttle response, while Sport S+ mode adds adjustments to the suspension for increased responsiveness. Normal mode offers a balance between fuel efficiency and performance, while Eco mode focuses on adjusting climate, throttle, and engine power to achieve optimum fuel efficiency. There’s also the RX 450h F Sport trim, with a sport-tuned suspension, LFA-inspired instrumentation, and F Sport styling inside and out for those who want a more performance-oriented hybrid. The signature Lexus spindle grille is bold and aggressive on the RX. It’s enhanced by available triple-beam LED headlamps with a three-projector design. In the rear, you’ll find L-shaped LED tail lamps that last longer than conventional light bulbs and brighten faster, so drivers behind you notice when you slow down. The retractable panoramic glass roof adds light and air to the RX, making the interior feel spacious and open. Standard infotainment features include an 8-inch display, HD Radio, Bluetooth audio, voice recognition, an auxiliary mini jack, two USB ports, and 9 speakers. Also available are a 15-speaker Mark Levinson premium Surround Sound audio system and a rear-seat entertainment system with dual 11.6-inch screens. This system allows rear-seat passengers to watch video from two different sources at the same time, meaning everyone stays happy on the next family road trip. The RX is a connected car, with plenty of features to let you keep track of your vehicle’s status and make your life easier. Lexus Enform Service Connect is accessible online or through a mobile app and gives you information on fuel level, mileage, and any maintenance needs. Lexus Enform Remote is another mobile app that connects with your car to remotely start the engine, lock and unlock doors, and even find the car when you can’t remember where you parked in that crowded lot. There’s also Lexus Enform Destination, which gives you 24-hour access to a live person who can help you locate a specific address or find a point of interest to guide you on your way. And as convenience features go, the RX 450h has a touch-free power door that is easy for anyone to use, even kids. You don’t have to wave your foot under the tailgate or stand there with the key fob in your pocket until the car figures out you’re there and opens. Instead, there’s a sensor in the rear door hidden beneath the Lexus emblem. Hold your hand, arm, elbow, or whatever in front of that sensor and the tailgate opens. The RX 450h also has advanced safety features with Lexus Enform Safety Connect. It offers roadside assistance whenever and wherever you need it. Even if you’re involved in a collision and are unable to call for assistance, the system will call for help and use the GPS to determine your exact location. The available Lexus Safety System+ provides a suite of features designed to keep you safe on the road. It includes pre-collision with pedestrian detection, dynamic radar cruise control, intelligent high-beam headlamps, and lane-departure alert with steering assist. There’s even a panoramic-view monitor that shows a bird’s-eye view of the car to help navigate narrow lots and tight parking spaces. Unlike with the purely gas-powered RX 350, you can’t get both flavors of the RX 450h in all-wheel drive. The F Sport, priced from $56,495, is only available in front-wheel drive. If you want all-wheel drive, then you’ll have to forgo the sportier version of the car in favor of the standard RX 450h, which starts at $53,035. What's your take on the 2017 Lexus RX Hybrid? MMRX450hFSAWD Thanks for the review. Your last paragraph is incorrect. I do have RX 450h FSport which is AWD. Users ranked 2017 Lexus RX Hybrid against other cars which they drove/owned. Each ranking was based on 9 categories. Here is the summary of top rankings. Have you driven a 2017 Lexus RX Hybrid?